What a place! If you ever get the chance to go, go. 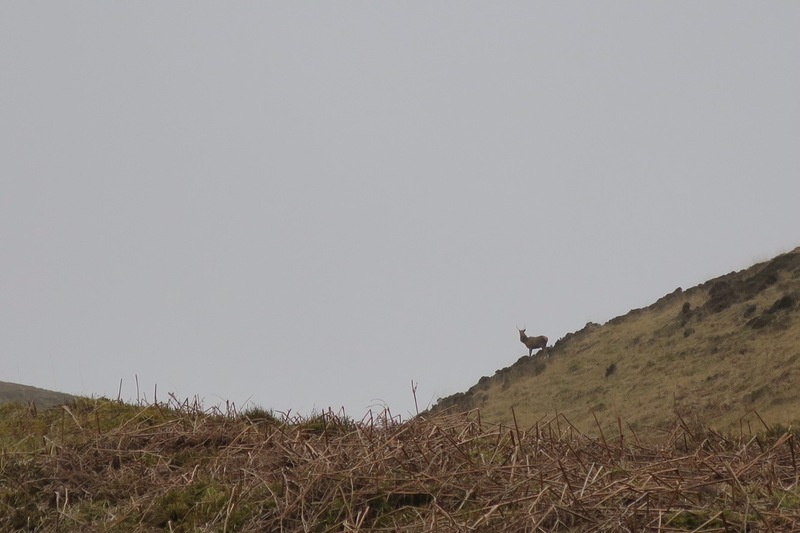 So much wild space (142 sq mi), so many deer (6000) and not very many people (192). Where to begin…? Well for all you ferry spotters out there who’ve been waiting with baited breath, these were our second and third ferries of the day. We then hopped on the bus (the bus, there is only one service – a minibus) along the road (the road, there is only one road and to most of us it would be considered a lane or track) to Craighouse where we pitched our tents on the patch of grass (the grass, there was only one flat grassy area and it was an extension of the beach, the village green, the rugby pitch, the football pitch, the picnic area, the pub garden and the campsite. 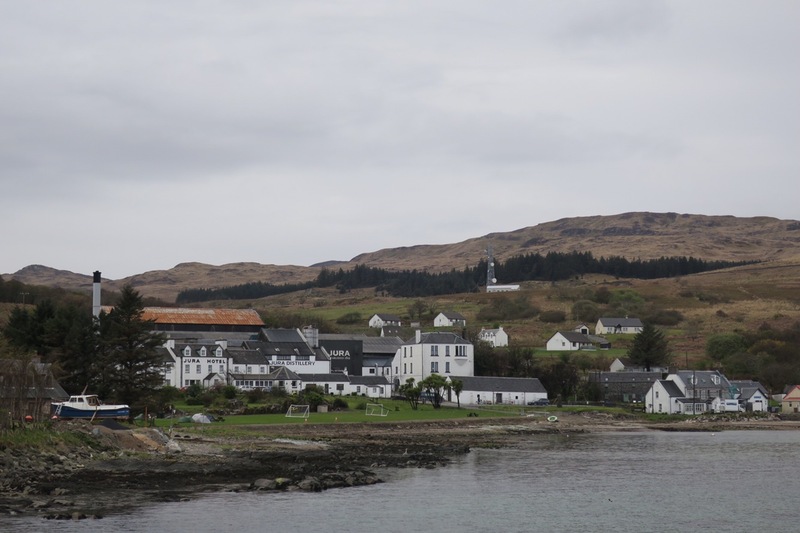 Our tents are in the bottom left hand corner of the photo (to the right of the boat) – it was very handy for the hotel bar and distillery! 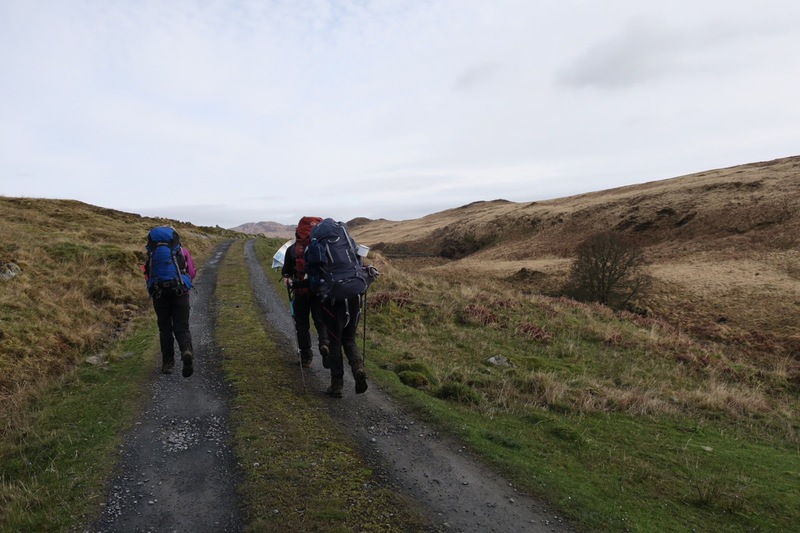 And so the walking began, at first we were on a track for a few kilometers then we turned off into the boggy, tussocky ground and headed up and over Ben Garrisdale and then down into Glengarrisdale Bay to find our bothy. When we arrived at the bothy Marcus was pleased to see that it had been renovated since he was last there – in its previous state he disregarded the bothy and camped instead. It was a large white cottage with a bright red roof and was visible from quite a way off. It had a hallway, a large storage cupboard and two rooms (a larger one with an open fire and enough of a sleeping platform for 8 people and the other with a stove and space for 3). We took the larger room, unpacked our things and then headed to the beach to explore and search for driftwood. On the beach there was, amongst other things, a beached minke whale, – which according to the bothy book had been there at least 3 days but judging by the smell probably a lot longer – a goat carcass, a few goat skulls, some small pieces of wood plus a 6ft fence post, oh and some seals…live ones. 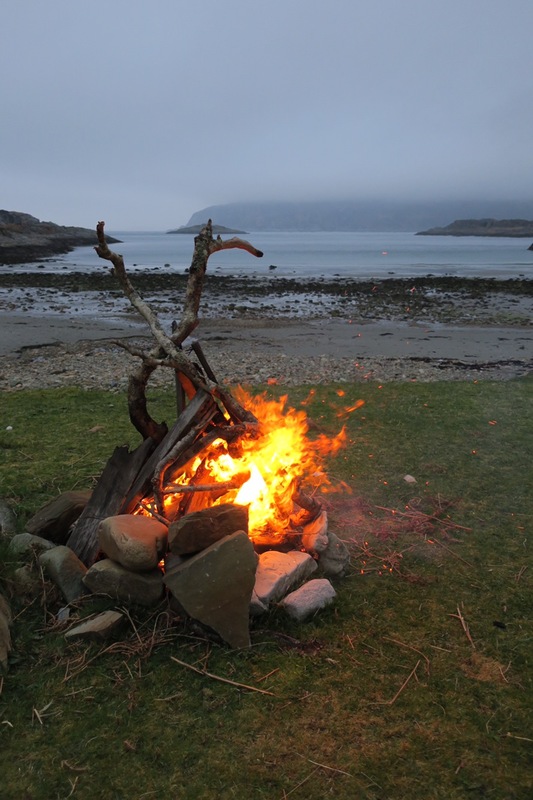 Back at the bothy, once the mist had rolled in off the hills 2 guys turned up with a sack of coal and a bag of fire wood and then later a boat landed on the beach and 5 people got out to inspect the whale – suddenly it felt like we were in a busy place! We ate dinner and whiled away the hours in front of the fire drying out various items of clothing (mostly socks), sipping whiskey and having a bit of a sing song with Marcus on the ukulele. Having lugged the giant post back to the bothy I only had the energy saw off one log so we kept the fire going by trading whisky for some coal and extra wood with the other occupants. The walk the following day was to be very different from the previous day – it was all coastal. We scrabbled and scrambled and squeezed our way up and over the boulders and under the cliffs that make the jagged west coast of Jura such a stunning place. 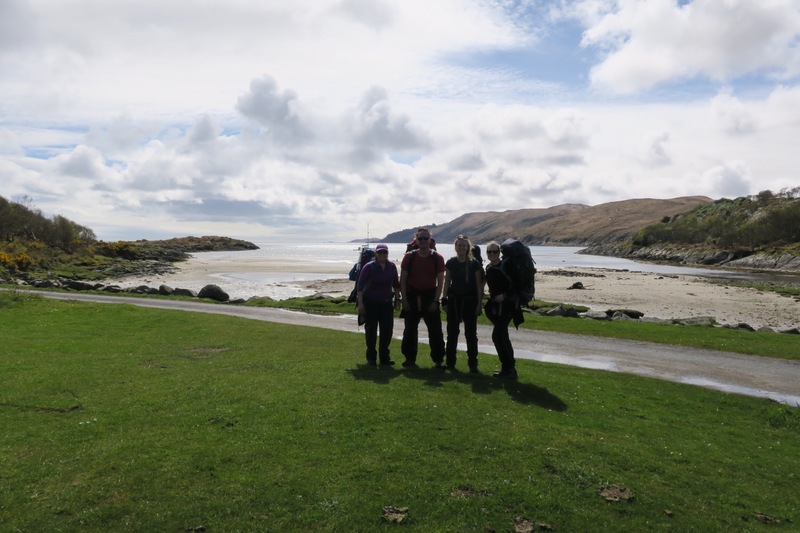 After 6 hours we reached Bàgh Gleann nam Muc (bay of the pigs) where we stopped to pitch our tents on the beach before heading off around the northern peninsula of Jura unladen. Off the top of Jura is a small, uninhabited rocky island called Scarba and between them is the Gulf of Corryvrecken where the underlying rock formations and the tides entangle to create a whirlpool. There are myths, legends and modern accounts that talk of this treacherous stretch of water and from high up on An Cruachan you could see unusual patterns and shades in the water. I was glad to be on solid ground! Once we returned to camp, Marcus set about constructing a fire (in an existing spot) but without firefighters we were all dubious. It turns out that alcohol gel soaked toilet roll wrapped around a stick makes a good substitute! After another evening conversing around a fire we headed to bed when the fire had burn itself out. We struck camp at 9am, after I had removed 10, yes that’s 10 ticks – the little blood thirsty buggers (no-one else reported to have any, grrr). 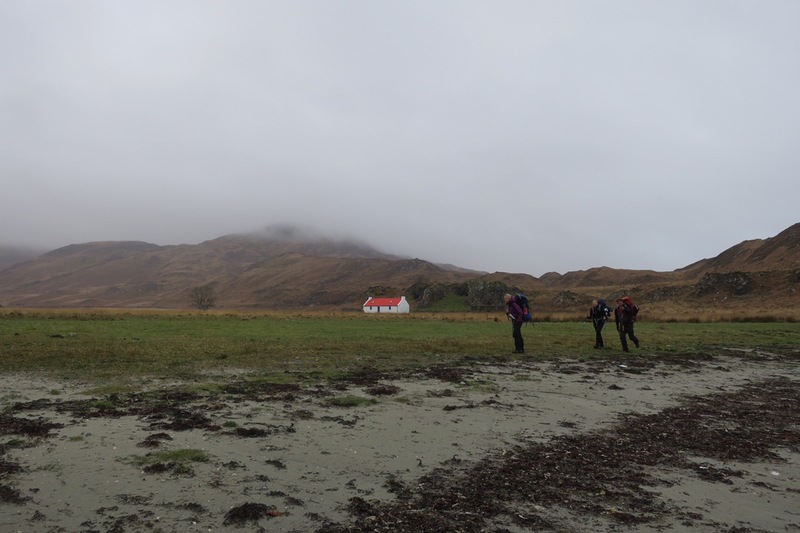 We headed back to the east coast to where we had got to the previous afternoon and found the footpath which led past a bunkhouse to the house known as Barnhill. Barnhil is where George Orwell came with his family in 1948 to write 1984. We were motoring once we hit the track which led back to Ardlussa where we had been dropped off 2 days previously. 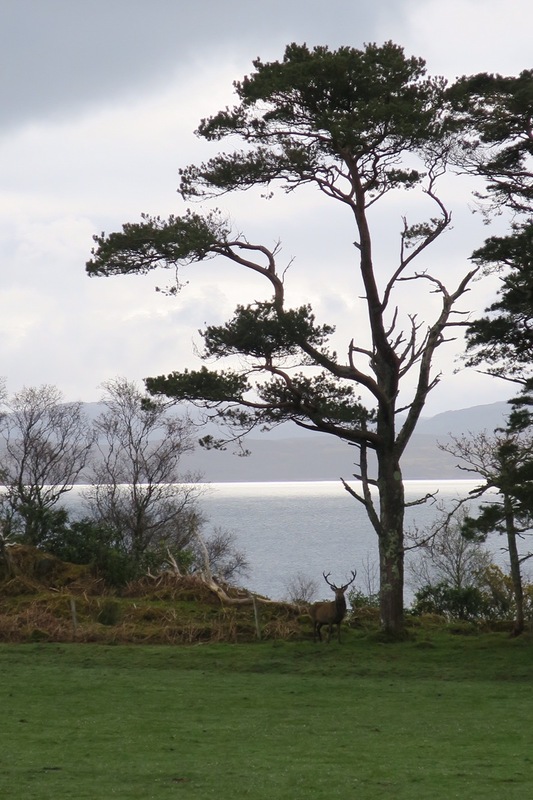 By 2:30pm we were down by Inverlussa bay drinking tea and eating cake (self-service from a horse box – there’s a first time for everything!). We enjoyed lazing about in some strong afternoon sunshine waiting for the bus – a well deserved rest. For the 3 ladies it was the start of a long journey home. Mine went something like this; bus, bus, ferry, ferry, bus, bus, train and mum taxi! 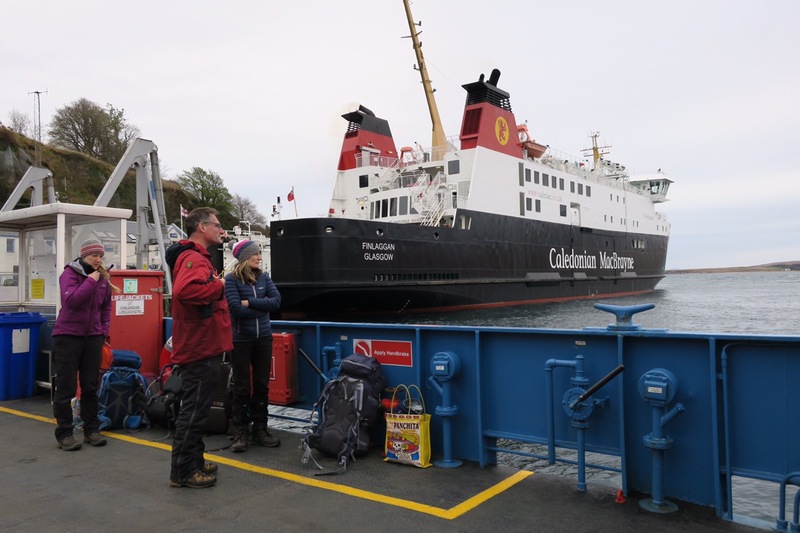 Marcus is still island hopping somewhere…no surprises there! Previous Previous post: A Sunny Holy Isle, a canter across Kintyre and off to Jura we go!